Take 60 seconds now to find out about our business. If you get acquainted with us now, it helps break the ice for when you’re ready for us to assist you. One of the Gold Coast’s longest-serving plumbing companies, we understand the Gold Coast & Brisbane drainage systems like no-one else. 24 hour emergency plumbers with 1 hour emergency response. Our menu pricing structure means we charge by the job, not the hour, and give you an upfront price before we commence the job. Whywait Plumbing believes you should know exactly who you invite into your home or business. So take 60 seconds now to find out about our business. If you get acquainted with us now, it helps break the ice for when you’re ready for us to assist you. Whywait Plumbing Services has always been a family owned and operated business, founded in November 1976 by Gary Mays. Michele Mays became actively involved in the business in 1979, and Whywait Plumbing celebrated 40 years of continuous service on 11 November 2016. We are proud that Whywait Plumbing Services have been your local and professional plumber for 41 years. 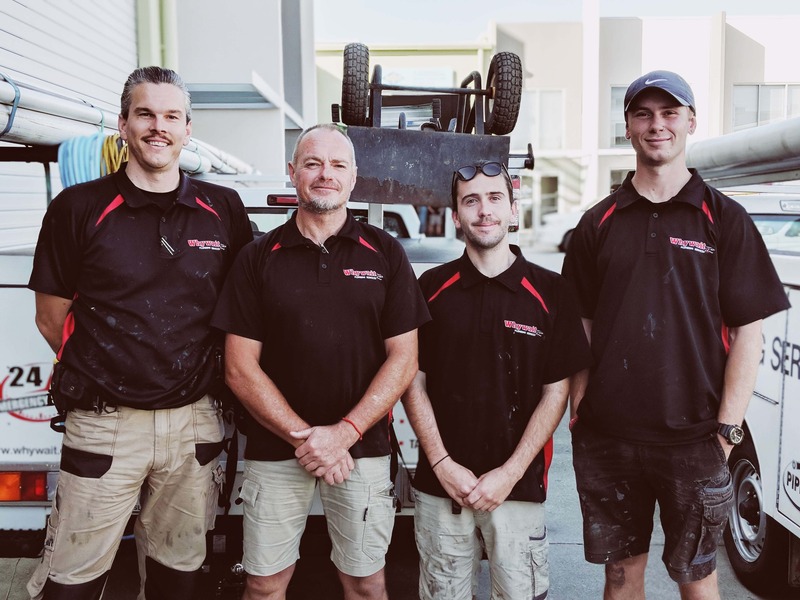 We are Licensed Plumbers and Drainers providing Gold Coast plumbing services to quality conscious and service orientated clients who require maintenance and installation services. Unlike many other Gold Coast plumbing companies, Whywait Plumbing provides guaranteed, professional service 24-hours a day, 7-days a week. We guarantee our service will exceed your expectations. These days the Whywait Plumbing administration office, warehouse and workshop are all centrally located at 75 Waterway Drive, Coomera, QLD 4209. This central location just off the M1 behind Dreamworld enables us to efficiently service our clients throughout the entire Gold Coast area with experienced and fully equipped Whywait Plumbing employees strategically located throughout the Gold Coast. 10. We are proud that Whywait Plumbing Services has achieved the following awards in being voted Best Plumbers on Gold Coast in 2002, 2004, 2006 and 2015 by readers of the Gold Coast Bulletin. Finalist for Australian Green Plumber of the Year in 2004 and 2006 and won the Nexstar Select Service, Award of Excellence in 2008 for customer service, company profitability and employee satisfaction. We’re looking for licensed QLD Plumbers to join our team. Please contact us for more information. Why not become a VIP Customer and become a Service Partner Plan© member? Enjoy the benefits of priority service, and 24/7 coverage all year! We offer a number of guarantees to our customers include same day guarantee, pricing guarantee and our trusted plumbing guarantee.